Join the discussion on our forums! 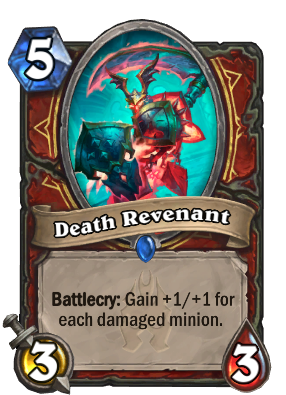 Come discuss Death Revenant over in our dedicated Death Revenant discussion topic. Buff this card +1/+1 to make it viable. Now it's too situational. magma rager award anyone ? I see this card neither from random effects nor packs nor anything else. A Frostwolf Warlord with 1/1 less stats that requires you to have damaged minions. If there are 3 minions on the board (With over 1 health), Whirlwind+this = a 2 card Dread Infernal, so you need there to be around 5 minions before it's worth it. I woulnd't say it's great, but I don't think it's awful either. However, at that point it's a 5 mana 8/8, which is the same as a Sea giant in that situation. I'd argue it needs to ramp harder to be playable, or start as 4/4 at least. Why would I play this over, for example, Sea Giant ? You actually only need 3 minions damaged for this to be worth throwing on the field. Not too difficult to do, but it would still probably be a bit too slow compared to other cards you could run in the 5 slot. Could've at least made this an Elemental. Maybe he has, and realized that even then this card is clunky. It's still a terrible card though. Very conditional and no immidiate impact for 5 mana. Realistically it's usually going to be a 5 mana 5/5-6/6 at best. But even more often it's a 5 mana 3/3.